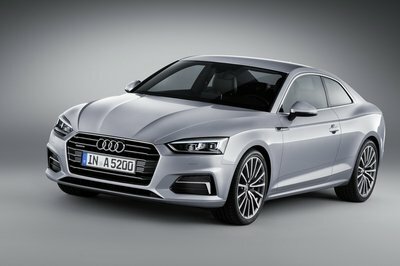 Audi just wrapped up the A5’s first decade with a bang – a move into its second generation. The A5 debuted for 2007 and made quite a name for itself over the past 10 years. 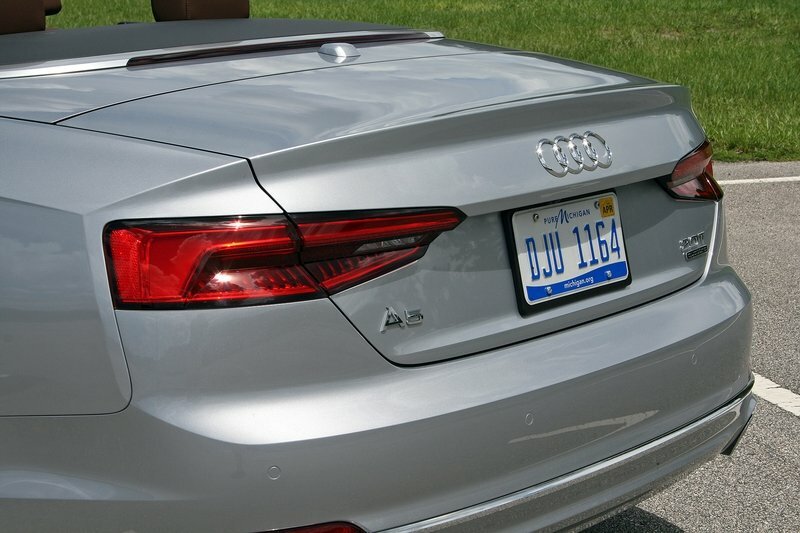 The second-generation A5 broke cover for the 2017 model year in Europe, but has taken the customary year before crossing the pond. Now Audi showrooms are filling with both Coupe and Cabriolet versions for 2018. My driveway is also home (though sadly, only for the week) to Audi’s new compact executive convertible. 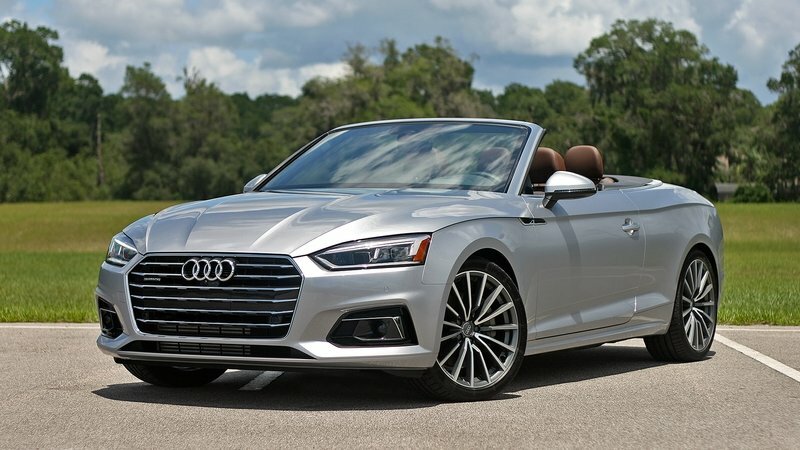 My Silver Metallic A5 Cabriolet is dressed in the range-topping Prestige trim and powered by the 2.0-liter TFSI engine backed by a dual-clutch and Quattro AWD. Its sharp bodylines and new hexagonal grille bring a new, more aggressive attitude to the A5. 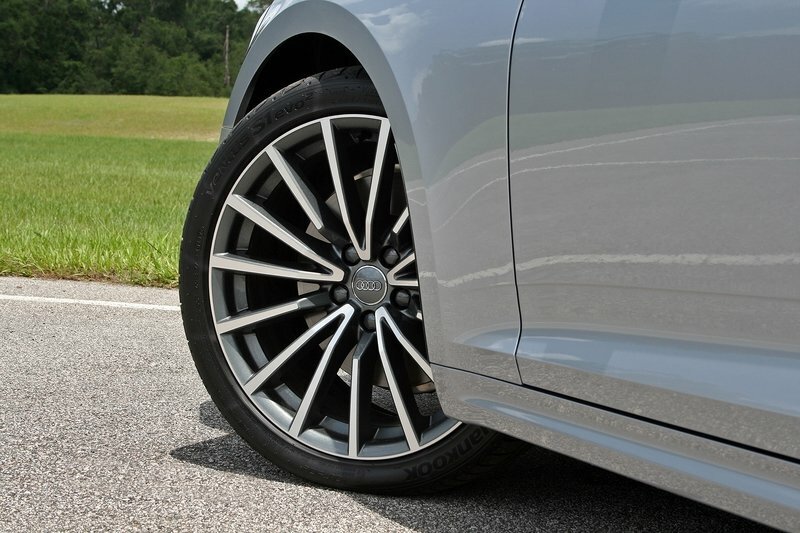 The optional bi-color, 19-inch multispoke wheels certainly help, too. 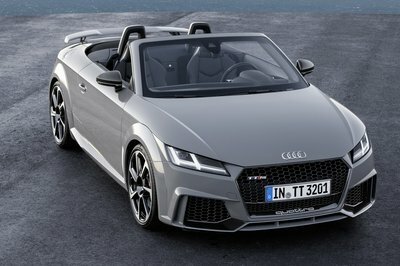 The angular design borrows from other new-age Audi products, including the swanky TT Coupe. In person, the 2018 A5 Cab is more muscular and purposeful – far more than the rounded and unathletic appearance of the previous car. Audi designers went even further with the A5 Cabriolet’s interior. Like the A5 Coupe, the cabin feels more like a cockpit thanks to its racy design, Virtual Cockpit instrumentation, and myriad of buttons scattered about. So what’s it like getting behind the wheel for the first time? Keep reading. The A5 looks like it’s moving quickly, even when parked in the driveway. 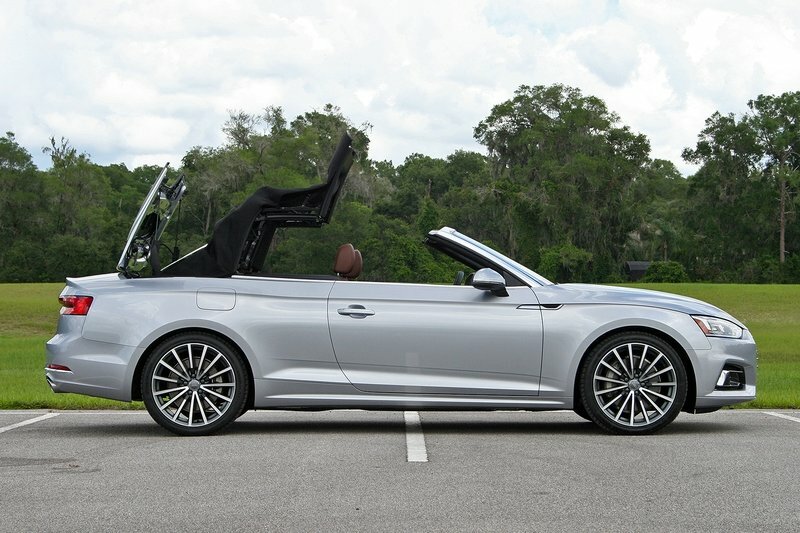 It’s worth repeating – the 2018 Audi A5 Cabriolet is far more handsome than the outgoing model. The sharp lines set a sportier tone for the driving experience, even before the doors are unlocked. For the first time, the A5 looks like it’s moving quickly, even when parked in the driveway. That definitely bodes well for the convertible’s desirability. Behind the long doors, my tester’s cabin is covered in the optional Nougat Brown leather and contrasted with Walnut wood inlays. The brown offsets well against the black dash and door panels. Sliding behind the wheel, the cabin feels homey with all controls within an easy reach. The three-spoke steering wheel feels great in-hand, as does the leather-wrapped electronic gear shifter. Growing accustomed to the shifter does take time, since its push-button Park position is foreign to most drivers. Selecting Park also takes half a second longer than it should, necessitating some mental focus to ensure the car isn’t going to roll away. Honestly, it’s not my favorite shifter design, but owners will learn it quickly enough. At the opposite end of the intuitive spectrum is Audi’s MMI touch system. The rotary dial and nearby toggle switches make quick work of navigating the MMI’s menus. What’s more, the black area atop the knob recognizes handwriting, allowing for data entry in the most natural way – simply draw out each letter and number, say of an address, and the MMI system converts it to digital text. Swiping a finger left erases mistakes and spaces are entered by swiping right. Of course, the speech function works well, too, and is useful for staying focused on driving. Radio presets are best accessed via the hard buttons just above the knob. The A5 Cabriolet lets plenty of air inside when its soft top is down. While the leather is nice and the MMI system is well designed, first-time passengers immediately stare at the Virtual Cockpit. This fully digital gauge cluster offers more information than just speed, engine revs, and mileage information. The high-resolution, 12.3-inch LCD screen boasts Google Maps and beautifully organized and graphic menus for various features. Pressing the “View” button on the steering wheel reorganizes the screen, making the speedometer and tachometer smaller, giving more room for these secondary items. Navigation maps are especially attractive in this configuration and is especially handy when following directions. Generous map labeling even makes self-guided navigating a breeze. 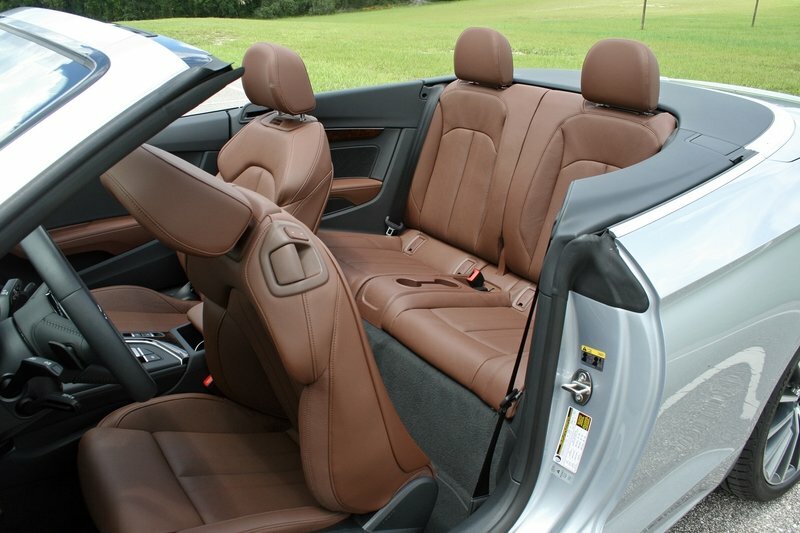 And speaking of breezes, the A5 Cabriolet lets plenty of air inside when its soft top is down. A one-touch button sends the power top folding into the trunk in only 15 seconds at speeds up to 30 mph. Another one-touch button raises the top, taking only 18 seconds to finish. All four side windows can be controlled individually or with a handy all-down button. Audi has done a great job insulating the top, both from outside temperatures and noises. The cabin is very quiet at highway speeds. Creating speed with my A5 Cabriolet tester is extremely effortless thanks to the 2.0-liter turbocharged four-cylinder. 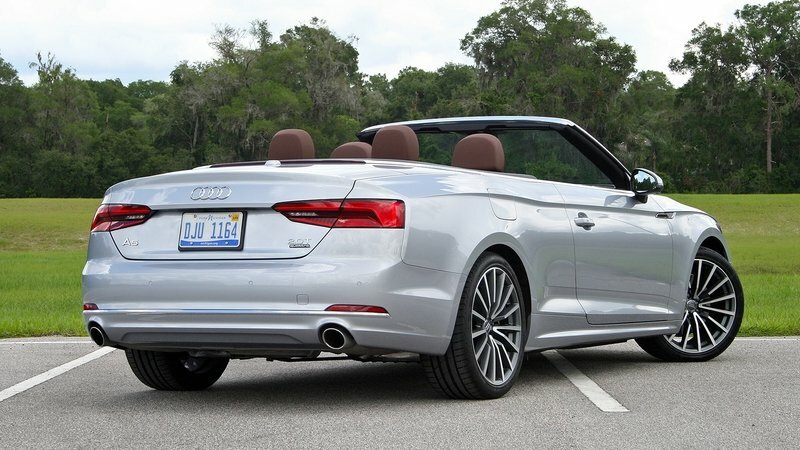 Creating speed with my A5 Cabriolet tester is extremely effortless thanks to the 2.0-liter turbocharged four-cylinder. It’s the same engine found in the 2018 Audi A5 Coupe. The engine is comprised of an iron block and aluminum cylinder heads. Direct injection feeds premium fuel into each cylinder and an intercooler keeps intake temperatures in check. 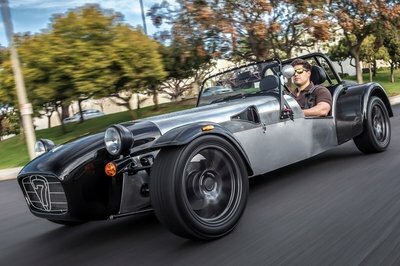 The result is 252 horsepower at 6,000 rpm and 273 pound-feet of torque at only 1,600 rpm. 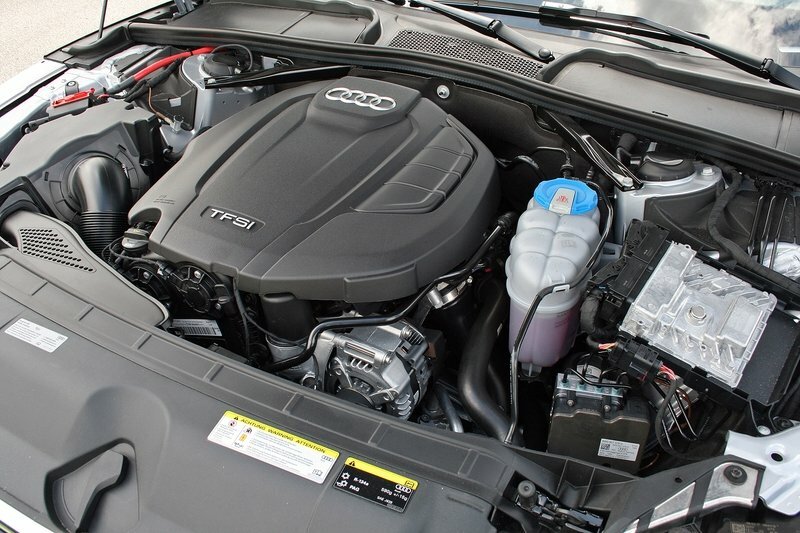 The engine is longitudinally mounted inside the A5’s engine bay. It’s mated to a seven-speed dual clutch automatic transmission. The gearbox sends power rearward like a conventional automatic, but also sideways to the front wheels thanks to the Quattro AWD system. Interestingly, every inch of the four-cylinder hangs ahead of the front axle. This positioning hasn’t negatively affect the car in daily driving, so far, but I’d bet the heavy noise would make itself known on a racetrack or road course. Nevertheless, the A5 drives effortlessly around town. The TFSI is butter smooth and pulls hard, especially in Sport mode. 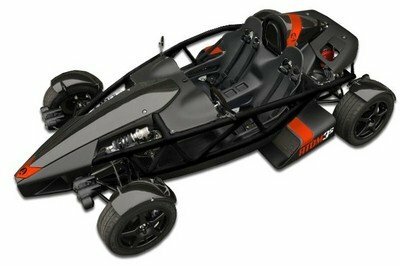 That drive mode also tightens up the steering, quickens the shifts, and firms the adaptive damping suspension. The change between Comfort and Sport modes is vast, making the A5 Cabriolet drive like it’s got a split personality. That’s a good thing, of course. I’m looking forward to spending a week with the 2018 Audi A5 Cabriolet. Mixed driving over familiar roads while doing everyday living should reveal the convertible’s true nature. 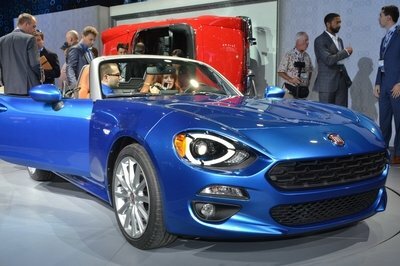 Any nit-picky issues, standout features, and memorable comments from on-lookers will definitely make my official review of the car. Stay tuned for that, right here on TopSpeed.com.